Credit union breaks ground on innovative new designs as part of ongoing effort to transform how their members experience financial services. 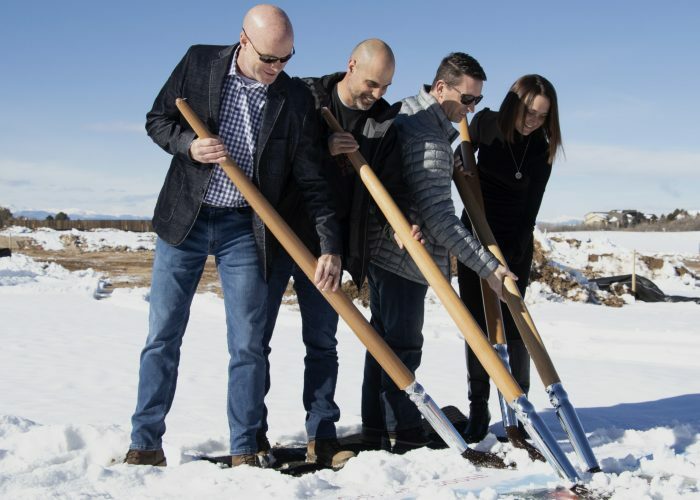 LONE TREE, CO (January 18, 2019) — Canvas Credit Union broke ground on a bright and sunny afternoon, Tuesday, January 15, for their first branch location in Castle Rock. A quick stroke of an oversized paint brush revealed a rendering of the new Canvas Ridge Branch, located at the Northeast corner of Founders Parkway and Colorado Highway 86.
he groundbreaking ceremony took place at noon with community onlookers watching as Canvas leaders swept giant paint brushes to reveal renderings of the new location. Melt-in-your-mouth eats were on hand from What Would Cheesus Do?, one of the many Colorado business members at Canvas. Even the latest addition to the Douglas County Sheriff’s K-9 team was on-hand for the celebration. The Canvas canine (pictured), was added to the team late last year with help from Canvas donations to the Friends of Douglas County K-9 Unit. This groundbreaking is part of a larger transformation for the credit union. Canvas Credit Union launched in 2018 when Public Service Credit Union officially changed their name. While the name is new, the credit union has been serving Colorado communities for more than 80 years. Ready to paint a new path and shake things up, this groundbreaking is part of a far-reaching plan, as Canvas re-invents each of their 26 branches to embrace their shoulder-to-shoulder member experience. 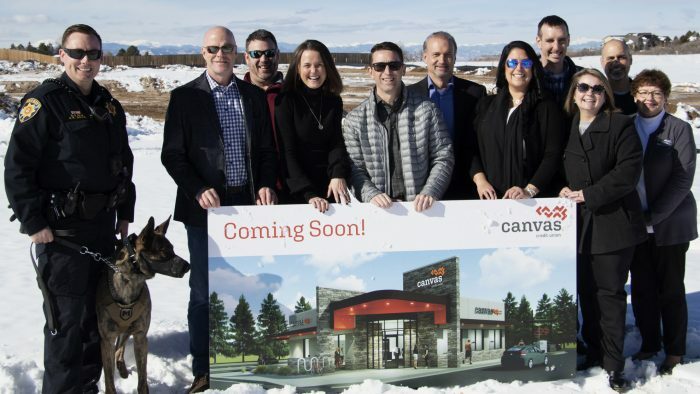 Canvas has already shown off this new vision at their Arvada Branch during a grand reopening of the renovated location in December of 2018. The new Castle Rock location will be the first of its kind built from the ground up. According to Chris Chippindale, Chief Operating Officer at Canvas Credit Union, all their future locations will embrace a new open and welcoming vibe. Canvas Credit Union leaders reveal their new Castle Rock location rendering. Rock location rendering with the stroke of an oversized paint brush. Pictured left to right: Todd Marksberry, President and CEO; David Pierce, Chief Information Officer; Chris Chippindale, Chief Operating Officer; Tansley Stearns, Chief People & Strategy Officer.